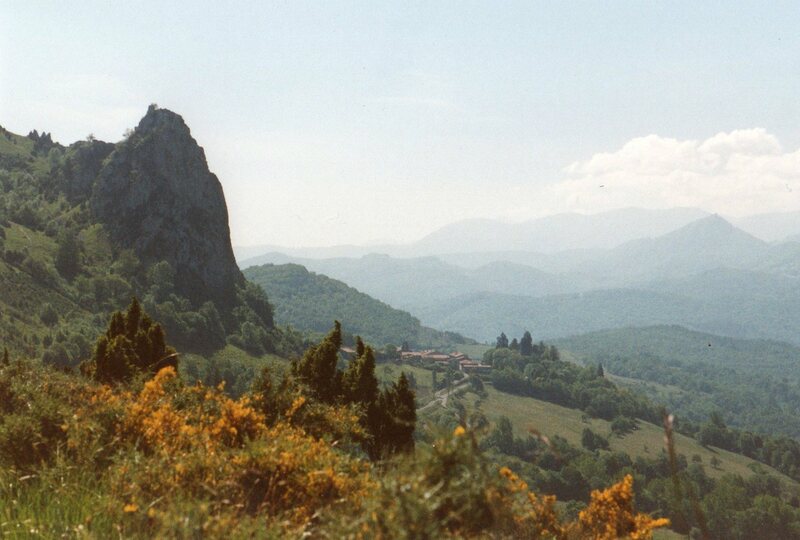 This track follows the trails between the strongholds of the Cathars - C13 heretics who were brutally suppressed by the Inquisition (which was formed for the purpose) - in the foothills of the eastern Pyrenees. Revel in beautiful scenery (mountains, meadows and gorges), improbably castles, enthralling (if tragic) history: eat superbly at the day's end. Wonderfully varied sections can be tackled individually to suit your taste. The heretical Cathars of the Languedoc were eradicated with fire and "inquisition" by the early 1320s. 700 years later, however, they still exert a powerful hold on the imagination and the Pyrenean foothills are still littered with reminders of them: the wreckage of extraordinary castles and a network of paths following the old trails by which the Cathars padded from village to village and evaded their persecutors. The Cathars were dualists, believing in a profound dichotomy between good, associated with the heavenly, light and incorporeal, and evil, associated with the earthly and material, including, fatally for them, the grand and powerful edifice of the Catholic Church, which they regarded as a hypocritical con . In their rejection of the wealth, corruption and venality of the established church, the Cathars were forerunners of the Protestant movements. The goodness and simplicity of the lives of the Perfects, people who lived lives of extraordinary simplicity and self-denial (they were known as bonshommes, or 'good men'), had a profound appeal for ordinary people, particularly women. The Languedoc in south-west France, in particular Toulouse, western Christendom?s third largest city in 1200, was tolerant and sophisticated, the birthplace of the courtly Troubadours. This atmosphere, and Languedoc?s relative independence from Rome, made it a fertile breeding-ground for this heresy, which is thought to have been derived from earlier Manichaean ideas, which had been transmitted from the Middle East westward, mutating into movements such as the (weird by any standards) Bogomils of Bulgaria, who had themselves been ruthlessly suppressed in previous centuries. These ideas took hold in northern Italy and southern Germany before reaching the Languedoc in the 11th Century, where they put down deep roots. 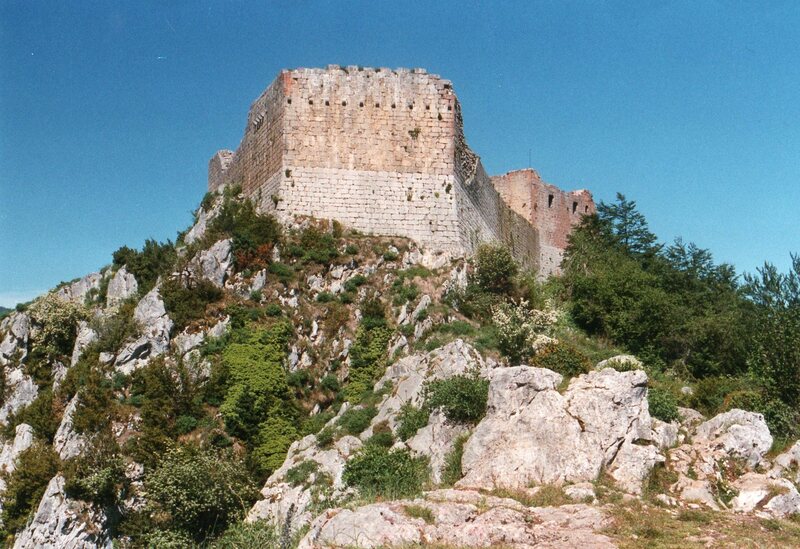 The response of the church was a campaign of debate, preaching and pressure on the nobility to suppress the Cathars. Its lack of success led eventually to the appalling Albigensian crusades (1209-1229), headed by the terrible but inspired Simon de Montfort. One of the least attractive episodes in a Christian history which is littered with horrors, it destroyed the Occitan power structures and the embedded support for the Cathars. It also led to the birth of the Inquisition and the honing of its procedures which were so infamous over the subsequent centuries - ingenious tortures and executions ? and which over three generations ripped out the remaining roots of Catharism from deep in the popular heart. As Alan Mattingley says in the Cicerone guide: ?Whether you conclude that they were martyred saints or credulous fanatics, you will surely find their story poignant. 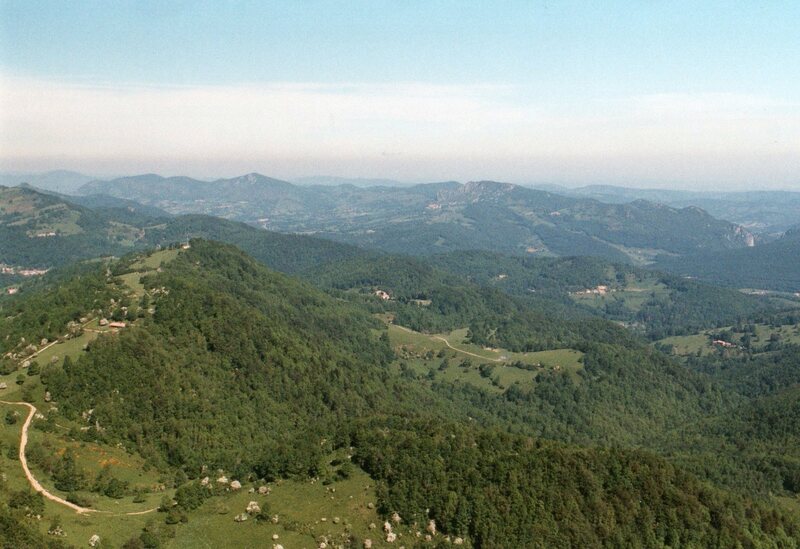 The relatively recently created Sentier Cathare winds, for some 250km, along old paths westward from the Mediterranean coast inland to the pleasing upland town of Foix, taking in great Cathar sites, nine castles in particular, on the way. It is divided into 12 day-stages, although you can take longer and explore more fully, or, as many do, tackles a few days' worth. 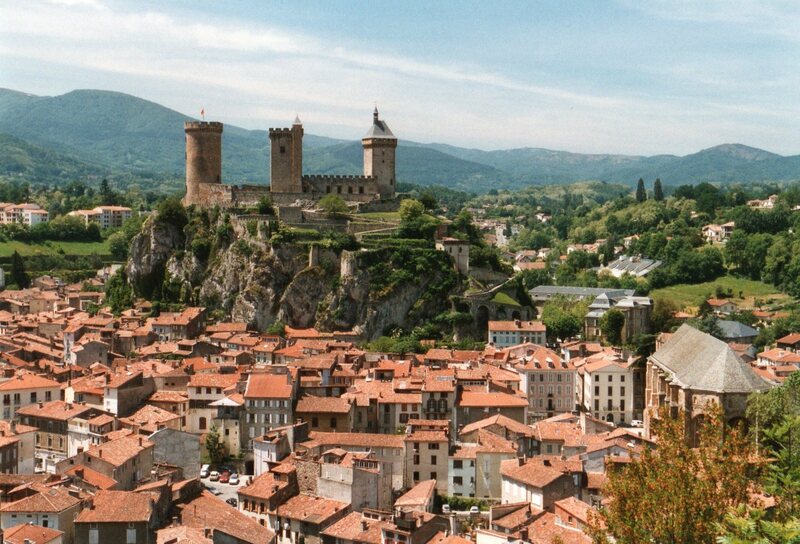 It is perfectly possible to start in Foix, and indeed, if you aren't going to have time for the whole route, the western end has the best combination of scenery and history. And you can turn south down ancient routes such as is now used in part by GR107 (the Chemin de Bonshommes), and cross the Pyrenees along ways once used by Cathars to escape their persecutors. While the amazingly sited Cathar castles are the visual and historic highlights of the trail, you will encounter chateaux and churches, farms, villages and vinyards. 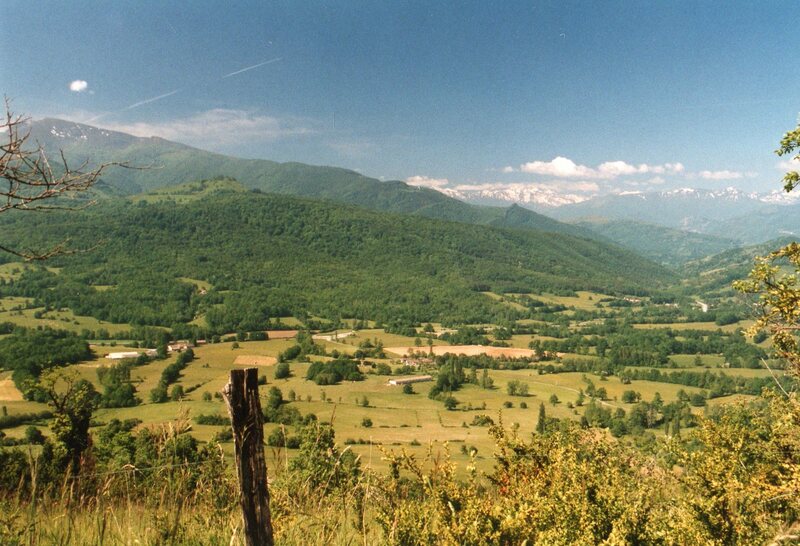 The Sentier is not just about history, though: it passes through an exciting array of landscapes, from hills and plateaus to gorges and farmland; through desolate limestone hills and karst features, vineyards, forests and meadows; with the high, often snowy, Pyrenean ridge as a regular backdrop. The Sentier is well planned (with some excellent variants to ensure all tastes are catered for) and marked, although west-east walkers will find wayfinding more demanding. There is plentiful accommodation of all sorts en route, much of it open most of the year but check carefully when planning, so there is no need to carry heavy loads, although you can take a tent and camp if you wish. There are taxi firms that will transport your baggage. The eastern stages are lower, although they involve more ups and downs than most stages, and are hotter and drier, crossing often broiling limestone hillsides. The further west and up you go, the landscape becomes a mix of forest and farmland, with lovely meadows on the higher ground. 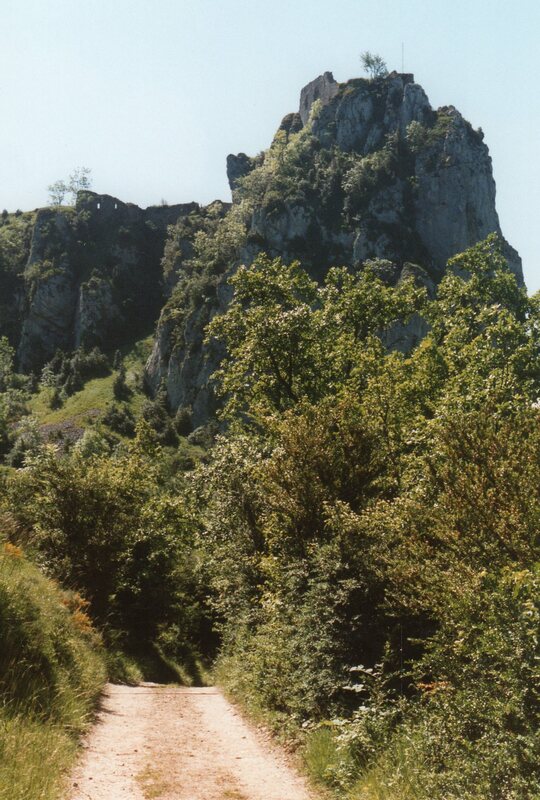 Stage 3, which passes remarkable Quéribus castle in dramatic limestone scenery. 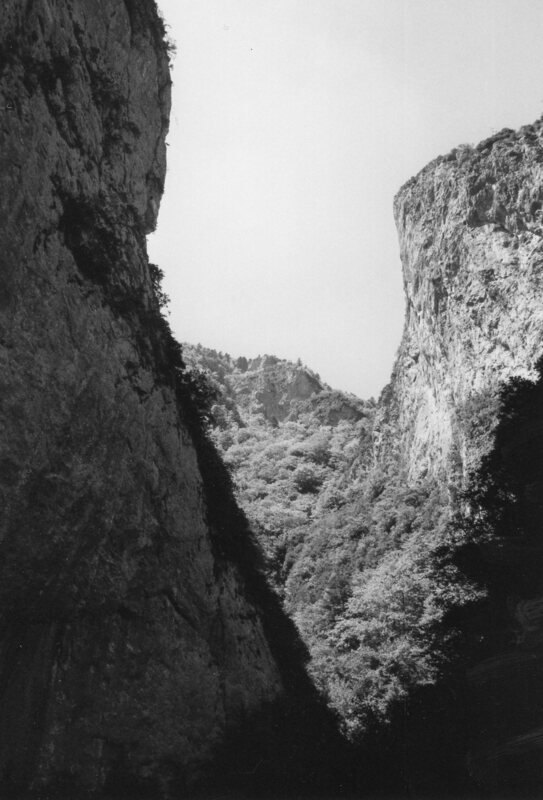 Stage 5, which views three castles and swings through the deep Saint-Jaume Gorge, all the while in rocky limestone scenery, gradually entering forested countryside. 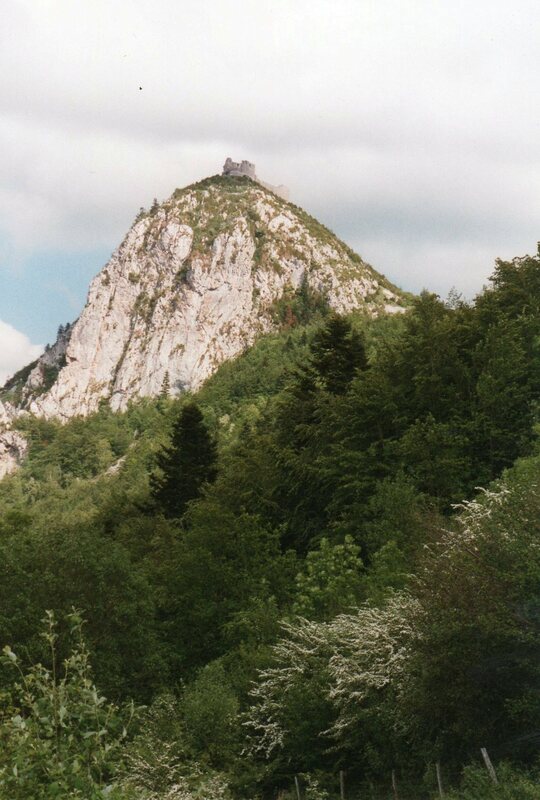 Stage 9, Espezel to Comus, which get the the route's highest point, commanding superb views, including looking across the deep, deep Gorges de la Frau to famous Montségur castle. Stage 10, Comus to Montségur through the magnificent Gorges de la Frau. Stage 12, fantastic Roquefixade castle (Walkopedia's favourite after Montségur) to charming, inviting Foix beneath its great castle, home of the famous eponymous counts much of the time on a particularly delightful meadowed ridge with huge views north across farmland and hills to the high Pyrenees ridge. As is so often the case, the essential book is Cicerone's The Cathar Way. The Sentier Cathare as we walked it starts or ends at Foix, home of the doughty eponymous count, Raymond Roger, whose mother and sister were Cathar “perfects”, as was his son. A later count, Gaston, was one of the heroes of mediaeval chivalry. The high towers of the castle still dominate this pleasant, relaxed upland town. 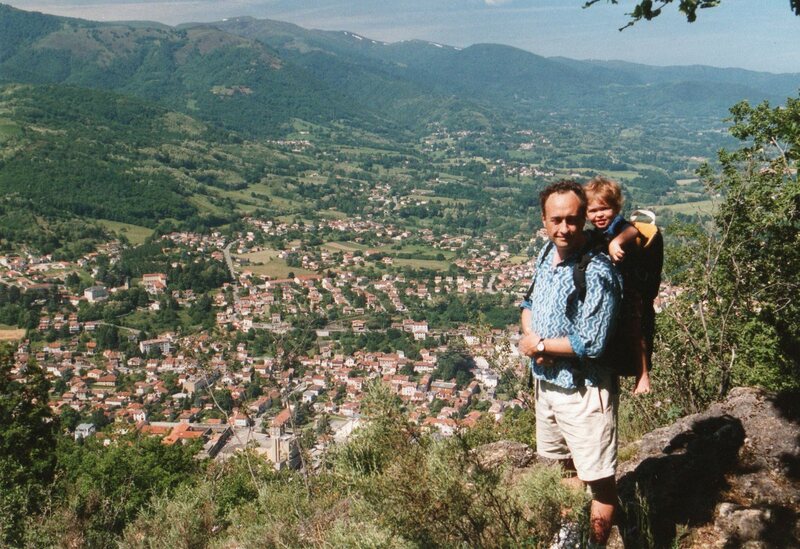 Part of the delight of this walk is that meanders between atmospheric and interesting towns and villages where full French meals can be had at leisure while the pleasures of the day are contemplated.